Driving along Sunset Blvd. I stopped into the House of Blues to try celebrity chef Aaron Sanchez’s newly designed menu. Many know this chef as the co-star of Food Network’s hit series, Chopped. He also stars in the series, Aarón Loves NY, and the travel-food show, MOTOCHEFS.Sanchez brings new life and energy to the 20-year-old House of Blues in Hollywood. 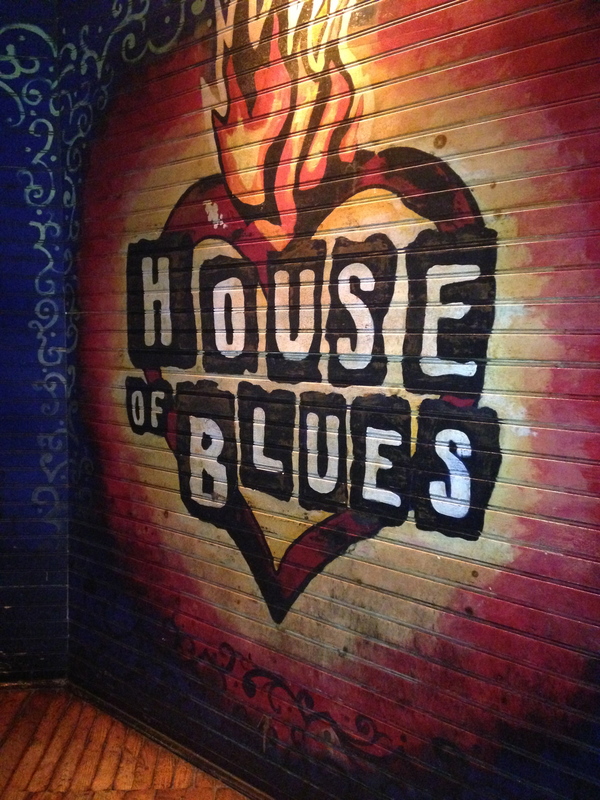 Ashton Spatz, the new Sr. Marketing and Promotions Manager of House of Blues, invited me to come and experience their new Summertime Blues on Mondays at 7:30 p.m.
A friend and I arrived early and slid into a booth inside the intimate Crossroads room. I learned that actor and musician Chris Mulkey was performing on the Voodoo stage. Mulkey is quite a singer and entertainer. He captured everyone’s attention with his terrific show. While sitting with Spatz, I was thrilled to see Kevin Finch as the new General Manager. I’ve known Finch for a few years, managing DISH in La Canada Flintridge. I also enjoyed meeting Spatz new Marketing team member Edward Guerra. For dinner, we tried a few of Sanchez’s dishes, including a warm cheesy dip with crawfish, spinach and artichoke with crunchy pita chips. We also had a shrimp salad and red beans with dirty rice. For dessert, we enjoyed a warm peach cobbler with a scoop of vanilla ice cream. Sanchez is not in the kitchen most of the time, because he is busy with his television engagements, yet the House of Blues replicates his recipes step by step. I remarked about the eclectic and colorful art pieces on the walls. I learned from Spatz that the House of Blues has the largest Folk Art collection with over four million dollars worth of art displayed throughout the 12 House of Blues venues. She also shared with us that the first House of Blues was built in Cambridge, Massachusetts in 1992, inside a historic colonial house. The owners opened the doors on Thanksgiving Day and fed meals to the homeless inside the house before opening later in the evening to the public. This tradition continues every Thanksgiving. After dinner, we took a tour of the three-story concert halls and private rooms. The difference between the House of Blues and other music venues on Sunset, is the combination of food and music. The House of Blues books Rock and Roll, Blues and Hip-Hop bands while serving Southern comfort food with a California twist. The Viper Room, The Roxy and Whiskey A Go Go don’t serve food. Touring the Music Hall we learned the room can accommodate up to 1200 people. This is where their Sunday Gospel Brunch opens its doors to the public at noon. Gospel producer and artist, Kirk Franklin books contemporary and traditional Blues bands, while guests eat a Southern cuisine brunch that includes chicken and waffles. Up on the wall in the BB Blues Bar are the words, “This joint is dedicated to the memory of our dear brother River.” The original investors in the House of Blues include Dan Aykroyd, James Belushi, Aerosmith, Harvard University, Paul Schaffer and the late River Phoenix. Before leaving, Spatz shared with us that The International House of Blues gives back to the community by allowing 50,000 students and their teachers to visit the Music Halls inside House of Blues with the Blues SchoolHouse program. The program incorporates folk art and music. On a guided tour, the group explores the history of Blues music. Be sure to catch a Summertime Blues show on Monday night now through the end of the summer. Chris Mulkey will be back on July 21 through the rest of the summer. A House of Blues band will perform on July 7 and 14. $$ 8430 Sunset Blvd. (323)848-5197.